Still Life With Cat: Empowerful! Sounds like a great course you are doing. Unfortunately I don't think there is anything like it around here. Rest assured it is imposssible to ever be the biggest moron in Bunnings. Just listen to some of the things blokes ask the red shirt people. "Do your own plumbing and get it wrong and all that happens is yo uget wet. Do your own electricity work and you might easily die"
Yes, concerned dudes (and thank you for your concern), the plug is indeed not finished which I sort of thought I'd said in the post. Re danger, Rose says she switches the mains power off before she so much as changes a light globe, because apparently in older houses (like mine) there can still be some sort of current current (so to speak) even with the light switched off. It's actually against the law to do any of your own electricity that involves hard wiring, nor do I ever plan to. Hubby is still reeling from hearing a Bunnings employee tell a customer that specially treated and sealed wood, designed for use outdoors was 'no good outdoors, it will just rot'. I knew he was wrong and I know bugger all about wood. 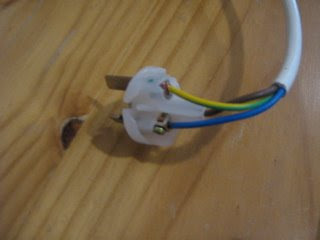 Just out of interest, does your extension lead have three wires to wrap around the screws or just the two? My vacuum cleaner has only two and it is forever exploding itself out of the powerpoint. (*BANG* oooooh! Looky. No safety switch here, apparently). I've had to repair this 'connection' that many times now, the lead is getting very short indeed. But I've been wondering if the problem is that there are only two wires when there should perhaps be three, maybe an 'earth' or something. I can't seem to justify buying wirestrippers for this one purpose alone, but I did buy a manual drill the other day. Works a treat. Tiling sounds like fun. Pulling the old ones off, maybe not so. I think you should be very empowered, especially after looking at that rewired plug. I didn't think they did these courses any more, but it sounds like a bloody good idea. Tap washer replacement, oil filter replacment, screwing in straight... these are all skills I sadly lack. I can change a fuse, but my house doesn't have any now. "Most home appliances these days, including vacuum cleaners are double insulated, in which case you only need two wires: blue (active) and brown (neutral)." I hate to be a nark, but since I am also a qualified electrician, and electrical safety is always an issue, I need to nark it up. Literally, you got your wires crossed: Blue is neutral and brown is active! You were about to jump in and retort that AC is not polarity conscious. However, you might then decide to connect a brown to a black or a blue to a red under the assumption you were connecting neutral-to-neutral and/or active-to-active. Do that and, as first revealed in the 1942 Book of Electrical Jokes (Bakelite edition), you would get one hell of a shock. Metaphorically. You might also, but not necessarily, upset any earth leakage or residual current protection. I realised later but it's bugger all. These ladies wouldn't combine brown with black anyway. There'd be a bang, that's all, in Brunswick Street. I've been thinking about doing this course for years too. Maybe I'll sign up for the next one - Id love to be more confident with empower tools and other handy things.